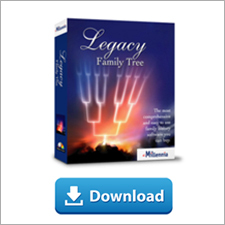 We have another great new update for our Legacy Family Tree 8 users (free) for you to download. It is mostly a maintenance release (a few bug fixes) and an update for those working with the FamilySearch tool. FamilySearch made changes to their API, so we've updated our software to continue to integrate with theirs. So...download the update to get the best Legacy ever! FamilySearch. We updated our software to keep up with the latest changes from FamilySearch. To learn more about how Legacy interfaces with FamilySearch, click here. View the July 30 release notes here. Windows 10 is here and we are pleased to report that Legacy Family Tree software works great! While I just installed Windows 10 this morning, many of our Legacy users have been testing Legacy with Windows 10 for months now without issue. Both look really good. From all the reviews I've read, like this one here, the new operating system is a good, solid release. It's also one of our hot topics right now on our new Legacy Facebook Group. Join the conversation or share your experience here. I received the following from one of our customers today and enjoyed it so much that I'm republishing it here (with permission). Decades ago when I first started investigating my 6th great-grandfather’s family of descendants I was particularly fascinated by the oblique notes I found in the older genealogies. Since then I’ve discovered that none of the above was entirely true if at all. I’ve also discovered descendants omitted, “died” or down-played in family accounts for more onerous reasons – multiple divorce, murder, kidnapping, suicide, medical tragedy and more. If like me, your twig of the family tree hasn’t exactly been pristine, consider the gifts these people have given you. Strength – if you have experienced one of these things as a near relative, realize that no matter how much you suffered at the time that you have survived it and congratulate yourself. You are strong. Perspective – if you know or discover that an earlier relative is a closet skeleton - thank them if you haven’t experienced the same thing yourself. If you have, also thank them – it means you aren’t the only family member who’s faced the same thing whether now or generations ago. Faith – Learn about the lives of your ancestors and their message to you. I have found at least three times that their survival is the miracle that I even exist. Embrace the past with love and sensibility. Learn as much as possible about your ancestors recent and distant and respect any medical problems those in your twig might have had – you may have inherited them as I have. Legacy QuickGuidesTM have quickly become one of the more popular resources for genealogists. Each guide contains four (sometimes five, sometimes more) pages of valuable information covering a variety of genealogy research topics, dozens of clickable links, and are written by genealogists and family historians who are experts in the subject areas. We've added another brand new Legacy QuickGuides: Ephemera: Genealogy Gold by Sharon Atkins. Now choose from 86 Legacy QuickGuides! In last week's blog post "Ancestors Please! How to ask for help online" I wrote about best practices for asking others for help on social media sites like Facebook. A number of people commented, asking where on Facebook to find genealogy help. In this post we'll explore five effective places for finding genealogy help on Facebook. You may not realize it but your very own Facebook wall might be the place to start. Who will better know your family history than your own family? Asking genealogy questions on your wall might prompt family members to share information you didn't know they had and they didn't realize you wanted. Keep in mind that that Facebook is not really private. Consider who else among your Facebook friends can see your discussion and decided whether the topic should better be handled in an email or not. The other great use of posting on your Facebook wall is to share with other genealogists. Genealogists has long since taken over Facebook and many of us use Facebook more for connecting with other genealogists than we do with old friends or family. In this case posting to your wall can be very effective. If you don't currently have a lot of genealogy connections on Facebook start by "friending" the genealogists you do know from your local society. Once you connect with a genealogist that is very active on Facebook you'll notice that they are tied in to a much larger community of genealogists on Facebook. That will be your entry into connecting with a very large community online. There are many groups dedicated to specific surnames. I belong to one group called the House of Learneds for Learned family descendants. Surname groups are perfect for posting a genealogy query but only if it relates directly to that surname. Be sure to read the group or page description to understand what the group is all about. The description for the House of Learneds says "If you are a Learned/Larned/Learnard/Larnett, etc. (no joke!) you can join. If you can state your lineage, even better! Please keep it light - no politics or religious proselytizing. Beyond that, you may say or submit anything you want. This is YOUR Facebook page!" To find surname groups try searching Facebook for the surname plus the word "family" or "genealogy" such as "Chandler Family." Keep in mind that some groups are created for a small group of family members for staying in touch or organizing reunions rather than connecting with all descendants. Try to get a feel for what type of group it is by reading the description before asking to join. Also, don't try asking questions about your other family lines or it might just get you kicked out of the group for being off topic. If you don't find a group for the surname you are looking for then try a group based on the location where your ancestors came from. This is a great way to get help from people who are experienced in researching in that same location. You may not share the same family but you may be researching the same records. There are literally hundreds of these types of groups on Facebook. One that I belong to is the Indiana County PA Genealogy group. And let's not forget the new Legacy User Group ! 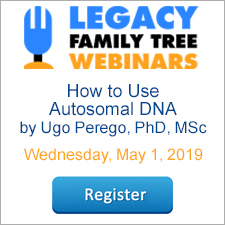 This group was created for people using the Legacy Family Tree software so most of the questions deal with genealogy as relates to the Legacy software. There is a terrific amount of sharing going on the group and not only will you learn about the software but you'll get some great genealogy tips too! Thanks to Alona Tester, Dawn Fulton, Liz Loveland, Clarise Fleck Soper, Joyce Homan and Elizabeth Handler for contributing suggestions to this article.